Towards the late 16th century, Domenikos Theotokopoulos, Greek icon-painter from Crete, sought his fortune in Venice, then Rome, then at Philip II’s court in Madrid. His quirky genius and difficult manners were rejected everywhere, and he wound up in Toledo, then a Spanish backwater. Here, despite falling out with senior clerics, he won acclaim, and lived for decades away from the mainstream, developing an increasingly visionary private universe of distorted, strangely lit pictorial forms. At his death, the great outsider was working on “Laocoön” – a portrayal of the elderly Trojan priest, his serpentine naked body twisted in pain, his eyes rolling, as he tries to fend off the looping, rearing snake sent by Minerva to kill him for daring to distrust “Greeks bearing gifts”. One of his sons lies dead, a ghostly figure; the other arches back as a second snake spans his body in dynamic circular motion, setting the entire composition whirling. In the background, the wooden horse trots calmly on, set not for ancient Troy but for a heaving, darkening nightmare version of the city of Toledo beneath a sky rent with storm clouds, streaked with white highlights. If El Greco saw himself as the Trojan horse of European painting, his subversive strategies had to wait three centuries before they truly infiltrated western art – in the deformations of modernism. El Greco had been more or less forgotten by history when Picasso studied “The Opening of the Fifth Seal” while at work on “Les Demoiselles d’Avignon” (1907), calling its creator “a cubist in construction”. A year later, a German critic lamented that “the youth have discovered Greco and now, besides this newest god, can tolerate no other”. 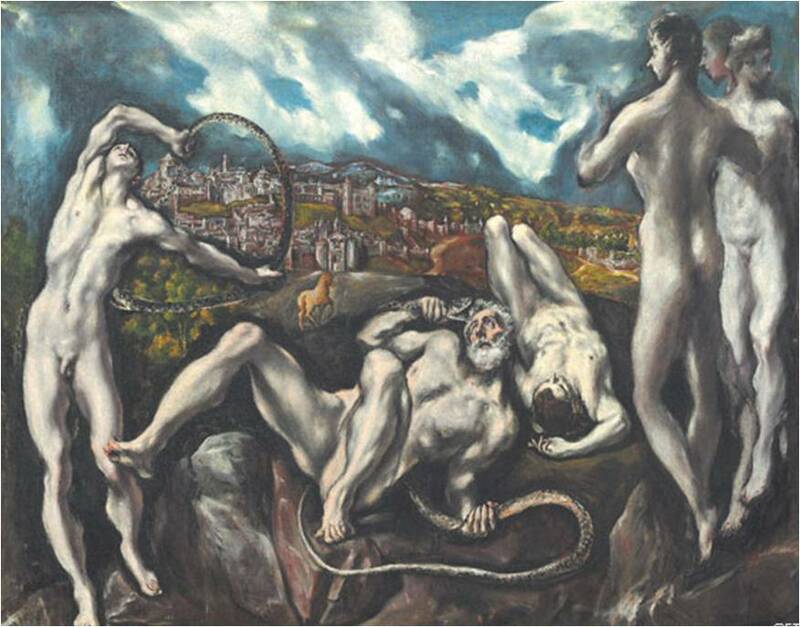 This is a story long waiting to be told: El Greco and Modernism, opening on Saturday in Düsseldorf’s magnificent art deco Kunstpalast, is, however, the first exhibition to dramatise, with some 100 canvases, the decisive effect on 20th-century painting of the Greek-Spanish master’s jagged, abstracting compositions, attenuated figures, and radical treatment of colour and light. “Laocoön”, a rare loan from Washington, has a special place here: exhibited in Munich from 1911-14, its elemental drama provoked young German and Austrian experimenters to produce a crowd of explosive scenarios that now appear to anticipate the catastrophe of the first world war. In Ludwig Meidner’s “Apocalyptic Landscape”, a seer-like figure, sprawled in the pose of El Greco’s tragic hero, collapses before a surging, ruined midnight-blue cityscape lit by glaring stars. Adriaan Korteweg’s “Laocoön” reworks the narrative in violent pink-grey swirling marks as a near-abstract composition. Oskar Kokoschka’s innocuous-sounding “Still Life with Putto and Rabbit” has the theatricality of a horror film, with grotesquely enlarged, mocking cherubs and a monster rabbit melting into a destabilised nocturnal landscape following the forms of El Greco’s Toledo. The most innovative modernists, as this show perceptively demonstrates, sought in El Greco mirror images of their own concerns. 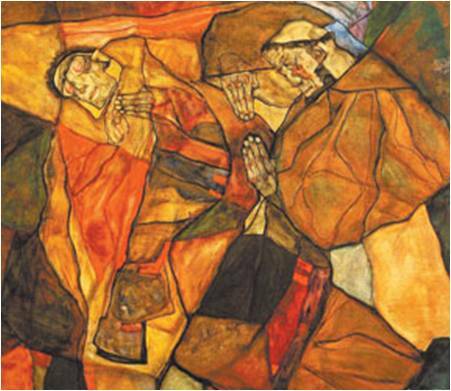 For Egon Schiele it was emotional expressiveness: the skeletal, pallid, racked bodies in “Agony (Death Struggle)” and “Prophets (Double Self-portraits)” have the elongated forms and agitated, nervous manner of El Greco’s saints, such as “St Francis and Brother Leo Meditating on Death”. For Max Ernst it was the proto-surreal disjunctions of colour and scale: Ernst’s sallow-green, reddish-orange “Crucifixion”, with stretched-out figures and many-towered cityscape, is clearly modelled on El Greco’s “Christ on the Cross”. For Max Beckmann, such oversized figures compressed into claustrophobic picture spaces opened the way to his own mythic narratives of good and evil. This can be seen most notably here in Museo Thyssen-Bornemisza’s “The Immaculate Conception” and Munich’s “The Disrobing of Christ”, where spiritual significance is implied by enlarging Mary and Jesus, icon-like, out of all proportion to setting and other characters.